I’m very pleased to say that I was interviewed about my research into science podcasts as part of a ‘Career Feature’ article by Roberta Kwok for Nature. The article features insights from several excellent science communicators, so I am humbled to be in such esteemed company! This came hot off the back of my study on science podcasting being published Royal Society Open Science the week prior. Link/DOI: https://doi.org/10.1098/rsos.180932 I am really pleased to get this work published as it is my first piece of solo work and the peer-review was very thorough. I hope it’s of interest and helpful to the science communication community. Amusingly, a photo of me on strike has made it's way into the March 3rd Edition of 'The Economist' magazine. I was interviewed about how my research in nanotechnology could help Batman! I wrote a guest blog for Errant Science Clutter, all about the challenges faced by early career researchers when applying for postdoctoral fellowships. Words are by me, cartoons are by Errant Science, and fellowship frustrations are shared by all. I paid £10 to get my name laser-etched onto an incredibly powerful spinning disk robot. Best £10 I've ever spent! What helps or hinders science communication by early career researchers? Recently I gave a 15 minute talk about 'What helps or hinders science communication by early career researchers?' at Re:Con Event in Edinburgh. This post includes a video of my talk and my presentation slides. A PHYSICIST TRIES TO GROW BACTERIA... for science! As a biophysicist in a biochemistry lab, I'm often learning new skills. To my surprise, recently I had to learn how to grow genetically modified bacteria to produce an artificial binding protein called an 'Affimer'. This blog post details nearly a whole week in the lab as I try to make these Affimers for the first time! A self-archiving checklist for before submission, before publication, and after paper publication. Writing a scientific paper is pretty challenging. But there are also a lot of ancillary things to do to ensure that people can access a free-version of your paper, and so that your funders/institutions have a version for them to track impact, and so that your paper gets some publicity! There is so much to keep track of, that I decided to come up with this helpful check-list! I hope others find it helpful. A surprise comic abstract by Errant Science! ErrantScience.com made a comic abstract for one of my papers! I love web-comics and I love science; so here is a list of science-themed web-comics. ASAP Science - science web-comic aggregating facebook page. Bird and Moon - nature and science cartoons. Brief History of Everday Objects - does what it says on the tin. ERC comics - web-comics about some of the research funded by the European Research Council. LEGO Grad Student - the LEGO grad student struggles through the world of academia. Lovelace and Babbage - gorgeous comics about the adventures of Ada Lovelace and Charles Babbage and how they invented computing. Pedromics - life in the lab is hard, but funny. 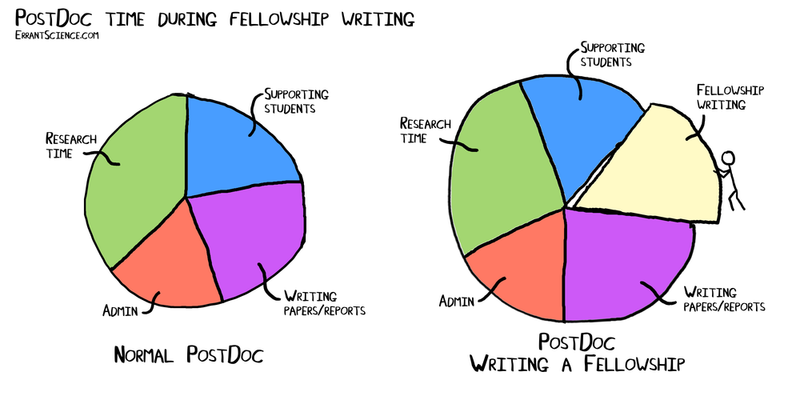 PhD Comics (Piled Higher and Deeper) - the truth about academia. The Awkward Yeti - not 100% science, but regularly featuring internal organs and planets. The Upturned Microscope - life in the lab is REALLY hard. This Isn't Nesseria - medicine, innuendo, and existential crisis. XKCD - maths, physics, computing, and brilliant data visualization. False Knees - irreverent comic often featuring birds. You might learn something. I'd like to make this list comprehensive with time, so you know some science web-comics that I've missed, then please email me at L.MacKenzie1@Leeds.ac.uk or leave a comment below and I'll add them to the list. I love listening to podcasts and I love science. Here is a big list of science podcasts that I’m currently aware of. This list aims to be eventually comprehensive, so if you know of some of science podcasts I’ve undoubtedly missed, then please email me on L.Mackenzie1@Leeds.ac.uk or leave a comment to let me know. Building a Hexastix: a pointy sculpture of mathematical madness and fun (for less than £5)! I was recently inspired to build a very fun object/maths sculpture known as a "Hexastix". This strange object is a curious assembly of 72 pencils held together with only 8 rubber bands! Hexastix are easy to make, and lots of fun to put together. Plus, all the supplies I needed for it were found on the high street for under £5 in total!